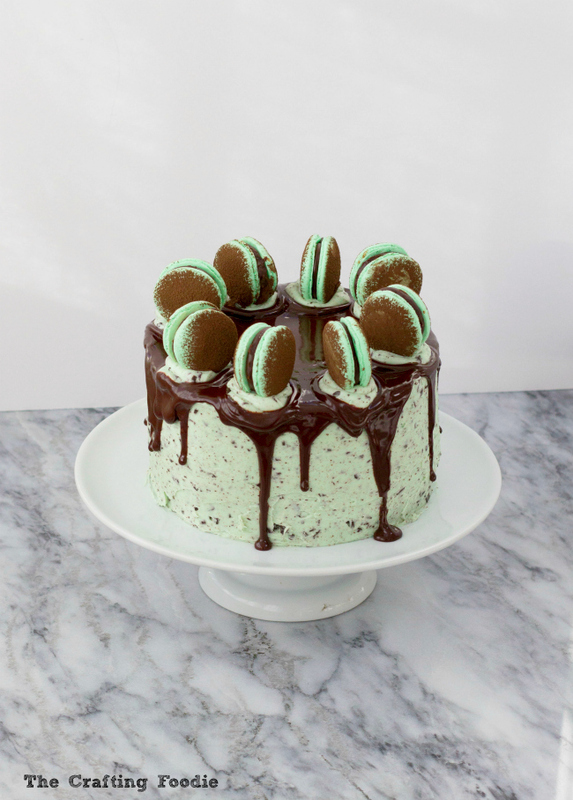 This Mint Chocolate Chip Cake is made with 3 layers of the moistest, darkest, chocolaty cake and it’s filled and topped with a light and airy mint frosting studded with chopped dark chocolate. And to make it even more decadent, it’s drizzled with a dark chocolate mint ganache and topped with these Mint Macarons. 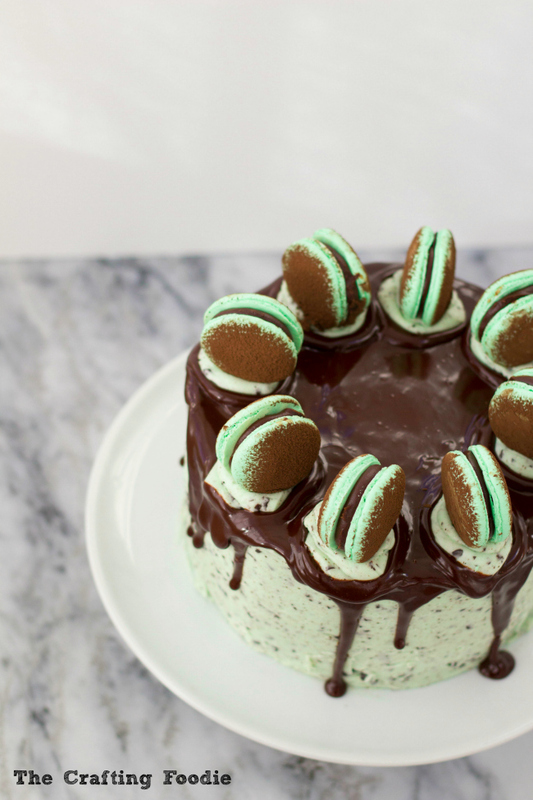 It s a cake truly fit for a mint and chocolate lover! Remember when I posted these Mint Macarons? I said that I’d be sharing a showstopping dessert where I used the Mint Macraons. 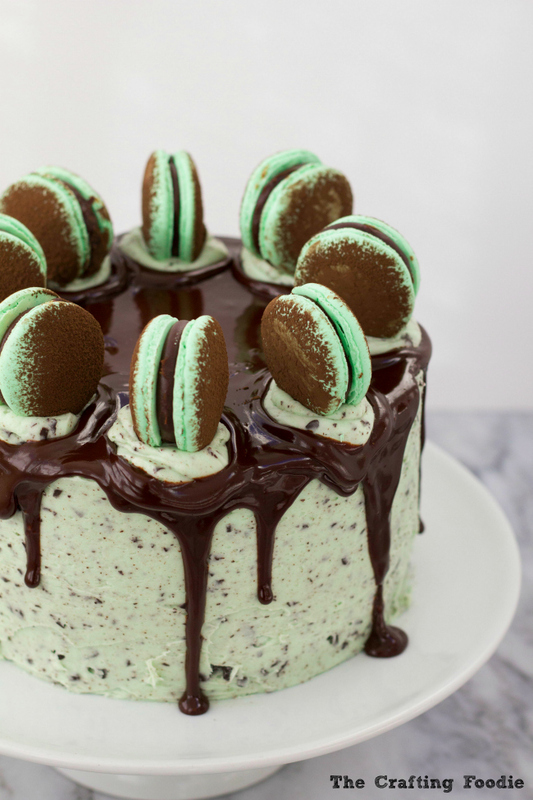 Well, here it is: a Mint Chocolate Chip Cake! I love cake. And I really love chocolate cake. My kids, well, they don’t like it that much. Actually, they just don’t like chocolate anything. But they do love mint chocolate chip ice cream. We always have a pint of it in the fridge, and it’s their go-to dessert (even in the winter). Since I wanted to bake a rich, dark chocolate cake, I knew my only change they’d eat a slice was if it was slathered in a fluffy, frosting that looks exactly like their favorite mint chip ice cream. Thus, this Mint Chocolate Chip Cake was born! I’m really into have what I think is the right ratio of cake to frosting. 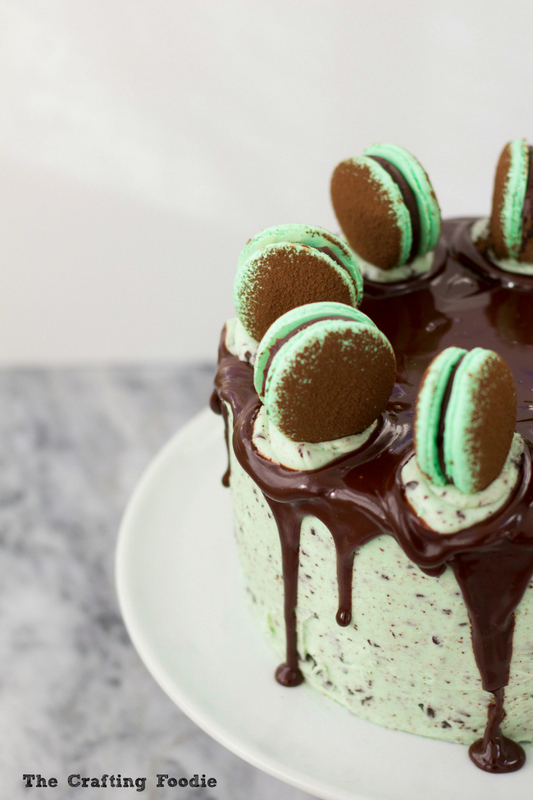 And this Mint Chocolate Chip Cake, with its 3 fluffy, moist layers of cake, is filled and topped with the perfect amount of minty, bright green frosting. While the chocolate cake layers in this Mint Chocolate Chip Cake rock my world (they’re moist, tender, and super chocolaty), the mint frosting isn’t too far behind. The chunks of dark chocolate that are folded into the frosting give the cake a crunch, and the dark chocolate combats the sweet frosting. My kids couldn’t get over how delicious the frosting is (plus it helped that the frosting looks exactly like their favorite mint chocolate chip ice cream!). 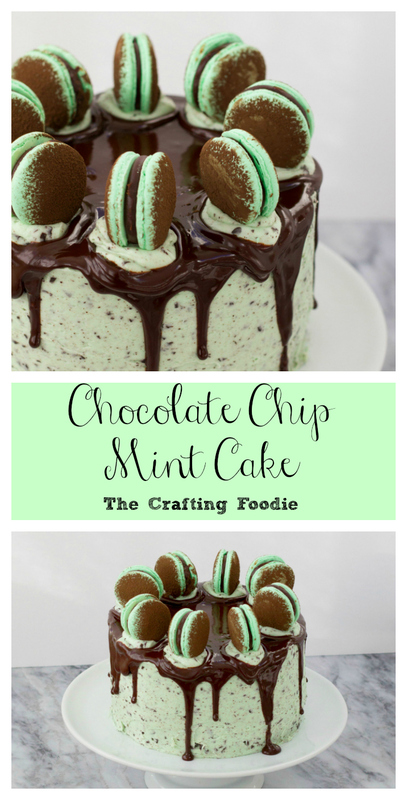 This Mint Chocolate Chip Cake is made with 3 layers of the moistest, darkest, chocolaty cake and it's filled and topped with a light and airy mint frosting studded with chopped dark chocolate. And to make it even more decadent, it's drizzled with a dark chocolate mint ganache and topped with these Mint Macarons. Prepare the macarons according to these directions. Grease and line the bottoms of 3, 8-inch round cake pans. In a medium bowl, sift the flour, cocoa powder, baking soda, and salt. In a large bowl, add the oil. Slowly add the oil in, whisking as you add it. Add the buttermilk, vanilla extract, and warm coffee. Mix until combined. Add the dry ingredients into the wet ingredients. Mix until just combined. Divide the batter evenly between the 3 prepared pans. Bake for about 25 to 30 minutes until a toothpick inserted in the center comes out with a few moist crumbs attached. Allow the cakes to cool in their pans for 15 minutes. Turn the cakes out on to a cooling rack. Allow the cakes to cool completely on the cooling rack. In the bowl of a stand mixer fitted with a paddle attachment, beat the butter on medium speed until fluffy (about 3 minutes). Add the confectioners' sugar, and beat on low until just combined. Increase the speed to medium high for about 5 minutes or until light and fluffy. Add the vanilla, peppermint and mix until combined. Add the cream and food coloring and mix until light and fluffy. Remove the bowl from the mixer, and using a spatula, fold in the chopped chocolate. Set the ganache aside to cool while assembling the cake. Using a serrated knife, level off the top of each cake layer. Place the first cake layer on a cake stand. Fill with a scant ¼ cup of mint frosting. Place another cake layer on top, and fill with a scant ¼ cup of mint frosting. Place the last layer on top. Place the cake in the refrigerator for 15 minutes. Place the cake in the refrigerator for about 15 minutes to chill. Pour the warm ganache over the top of the cake, and allow it run down the sides of the cake. Using a piping bag fitted with a large star tip, place mounds of frosting where you'd like to attache the macarons. Place the macarons on the mounds of frosting. Refrigerate. Bring to room temperature before serving. What a beauty! Scheduled to share to FB and pinning!! Oh my goodness!! This is gorgeous and makes this mint chocolate lover so happy! This is gorgeous! I love mint chocolate! I’m trying very hard not to drool. Your cake looks delicious. I have a board just for mint recipes. Will have to pin this later. What a show stopping cake. Absolutely beautiful! Wow, that’s a pretty cake! I had mint and chocolate on the mind this week too – I made some mint chocolate ice cream. What a great idea to put those flavors into a cake! Yum! My kids saw this over my shoulder and they are all drooling. Oh my gosh this looks amazing! I’ve never considered mint chocolate chip in anything other than ice cream! Drool….this looks absolutely de-li-ci-ous! 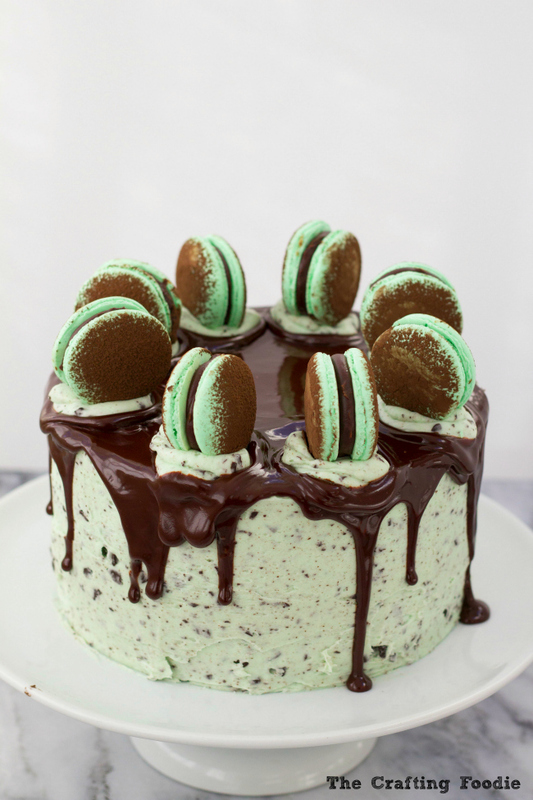 I will make this for my daughter’s birthday, she loves mint and chocolate!